See our list of all farmers markets on the Big Island for an overview of all local farmers markets. 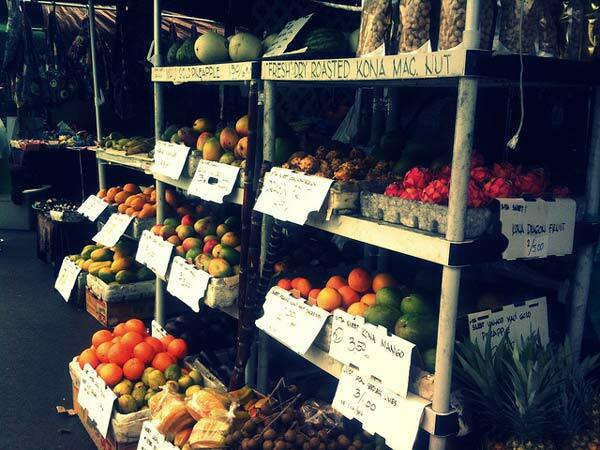 The Kona Farmers Market is a large market located in the heart of Kona close to Kailua Bay. You can find plenty of fresh fruits and vegetables, flowers and hand-made local arts and crafts. This is a good place to stock up on healthy snacks (apple bananas or lilikoi are very handy to pack) for a day trip or to buy gifts to take home. The Kona farmers market is located on Ali’i drive just south of Kailua Bay in the heart of Kailua Kona. It is open Wednesdays through Sundays between 7 a.m. and 4 p.m.
You can find more information on the unofficial website of the Kona Farmers Market. The Pure Kona green market Market (formerly known as the South Kona green market) is committed to sustainability, natural practices, and working with the earth to produce quality food and art for our local community. Stop by to get their weekly produce, enjoy a meal, and stay for the day. The Pure Kona Green Market. Image credit: the Pure Kona Green Market. For a more thorough review we recommend this report by Sonia Martinez for the Hawai’i homegrown food network. This farmers market is an all local farmers and artists market held at the Amy Greenwell Botanical Gardens at 82-6188 Mamalahoa Highway at mile marker 110, just across from the Manago hotel in Captain Cook . Market days are every Sunday between 9:00 am and 2:00 pm. You can find their website here. More information: directions and pictures of the Alii garden marketplace. More information: directions and pictures of the Kona Village Farmers Market.